In the autumn of 1827, Schubert gathered a group of acquaintances at the house of his friend Franz von Schober and sang to them the entire Winterreise. His voice was agitated, and the assembled throng were perplexed by the gloomy tone of what they heard. Schober commented that he only liked Der Lindenbaum. The 24 songs of the cycle were settings of poems by Wilhelm Müller, who also supplied the texts for Schubert’s earlier cycle Die schöne Müllerin (1823). Winterreise was composed in two parts. The composer had seen only twelve of Müller’s poems when the first group of twelve songs were completed in February 1827. He later discovered another twelve several months later, and set these in the October. The two parts were also published separately, the first on 14 January 1828 and the second on 30 December 1828. Schubert was still correcting the proofs on his deathbed; he died on 19 November. The cycle was originally written for the tenor voice, but has frequently been transposed to accommodate diverse vocal ranges. Each listener will have his or her own preferences. Whilst the tenor range is ideal for portraying the youthfulness of the protagonist, the baritone, for me, offers greater expressive power and range. The latter versions make up the lion’s share of recordings. My favourite versions include those by Matthias Goerne, Fischer-Dieskau and the bass-baritone Hans Hotter, the latter two in the versions with pianist Gerald Moore. In this latest release, the Greek baritone Dimitris Tiliakos, a name new to me, steps up to the mark admirably and doesn’t disappoint. 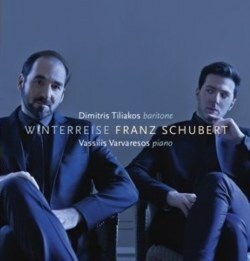 Here is Schubert at his most tragic, and Tiliakos conveys the full spectrum of moods, from bitter resignation and deep felt regret to an unbearable sense of loss. He has the advantage of being partnered by his fellow compatriot Vassilis Varvaresos, a sensitive and versatile pianist I came across only recently in collaborations with the young violinist Noé Inui (Navis Classics NC150040), a disc I had the pleasure of reviewing. Varvaresos ideally paces the opening Gute Nacht (Good Night), the plodding tread setting the scene for the painful journey which is being embarked upon. There’s a striking contrast between the unhappy minor key and the more positive major. Each performer is conscious of the other, with neither dominating. Tiliakos’ secure, focused tone, clear diction and idiomatic phrasing are convincing qualities he sustains throughout the cycle. In Erstarrung (Numbness) he portrays the agitation and inner turmoil to dramatic effect, supported by the pianist’s thrilling and passionate accompaniment. Der Lindenbaum (The linden tree), probably the most well-known song of the cycle, is a delight, with both performers savouring the rapt lyricism of Schubert’s melody. Similar attributes imbue Wasserflut (Flood); I particularly love the seductive way Tiliakos colours the line here. The weary tread of Rast (Rest) is evoked in this fatigue-laden account. This is in stark contrast to Frühlingstraum (Dream of Spring) which follows, refulgent yet innocent. This upbeat mood pervades Die Post (The mail-coach), the galloping of horses evocatively captured in Varvaresos’ highly charged accompaniment. There’s a bleak chill to Der grease Kopf (The Hoary Head), with the sparse piano writing adding to the glacial stillness of the landscape. If any song makes a strong impression it’s Das Wirtshaus (The inn), here delivered with calm, reverential resignation. In Mut! (Courage! ), Tiliakos projects his voice with firmness, courage and tenacity. The forlorn figure of Der Leiermann (The organ grinder) brings the cycle to a close, Varvaresos's world-weary piano accompaniment is subtly nuanced, a perfect foil to Tiliakos’ emotionally expressive vocal line, setting the seal on a most moving experience. Navis Classics are to be commended for the quality of their presentation. The CD is housed in an elegant gatefold with a stylish photograph adorning the front. The booklet contains an in-depth interview the artists gave to Dominy Clements, in which they discuss their relationship with Schubert’s cycle and expand their thoughts on the genesis of their interpretation. The acoustic of Westvest 90, Schiedam is warm, spacious and reverberant, with the performers excellently balanced. My only quibble is that Navis only supply a Greek translation to the German text. In a fiercely competitive field, this visionary interpretation and epic reading strongly makes its mark.